Ripple (XRP), a cryptocurrency developed by Ripple Labs, has surged by almost 50% in the last 24 hours as investors pile into the digital token after a Ripple Labs executive teased an exciting new feature. Sagar Sarbhai, head of regulatory relations for Asia-Pacific and the Middle East, earlier this week told CNBC that Ripple Labs is close to launching a new product that could help banks speed up transactions using XRP. "I am very confident that in the next one month or so you will see some good news coming in where we launch the product live in production," Sarbhai said. xRapid is designed to work as a bridge between different currencies around the world, allowing payment providers and banks to process faster cross-border transactions. Earlier this year Ripple Lab's chief executive Brad Garlinghouse boasted there would be "dozens" of banks using xRapid by the end of 2019. Following CNBC's interview with Sarbhai a Ripple spokeswoman said there isn’t currently an official commercial release timeline for xRapid. 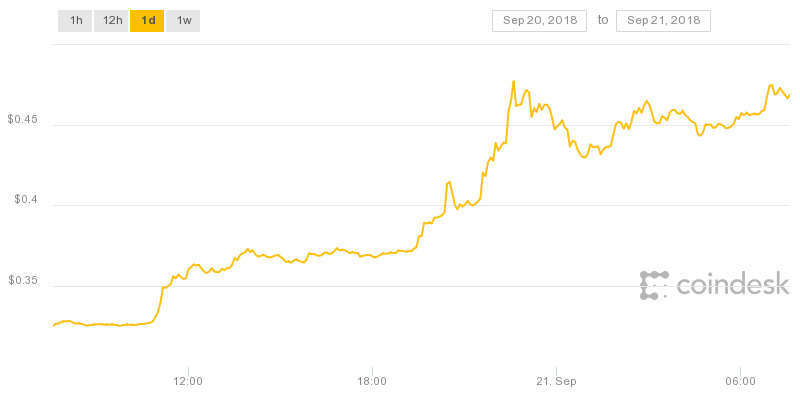 XRP is down some 80% from its peak as most major cryptocurrencies readjust after last year's huge bull run. The ripple price surged to more than $3 last year, up from just $0.006 it began the year at. It's now trading at a little over $0.40, giving it a market capitalization of $11.2 billion, making it the third most valuable digital asset. Ripple (XRP) has jumped over the last 24 hours, breaking its recent downward trend. Ripple, which was created back in 2012 (making it one of the oldest cryptocurrencies), sets itself apart from many other major digital tokens by working directly with the established financial services sector. Ripple's xCurrent helps banks to settle international transactions by using blockchain to confirm transactions in real-time at each stage of a cross-border payment.